The photos are via heath_bar/Flickr. We’re in Houston, Texas. Summer of ’86. First shot: if all those maps are connected, I’m impressed. 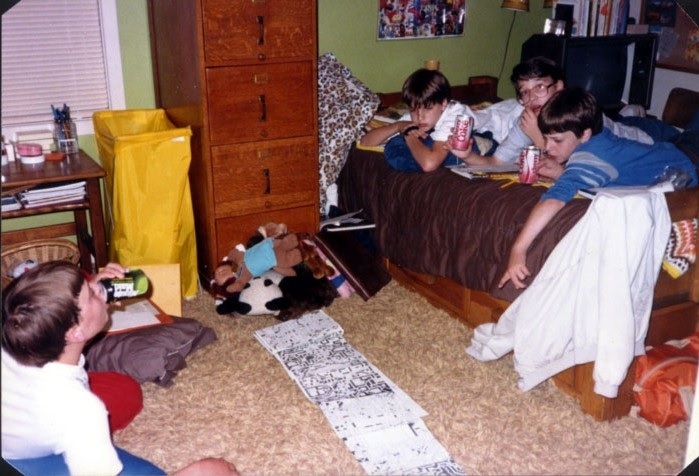 The kids on the bed are drinking Cherry Coke, which was introduced in 1985 after the New Coke disaster. Just seeing that can brings back the essence of summer when summers were free. How about one of the greatest ’80s commercials ever to jog your memory? 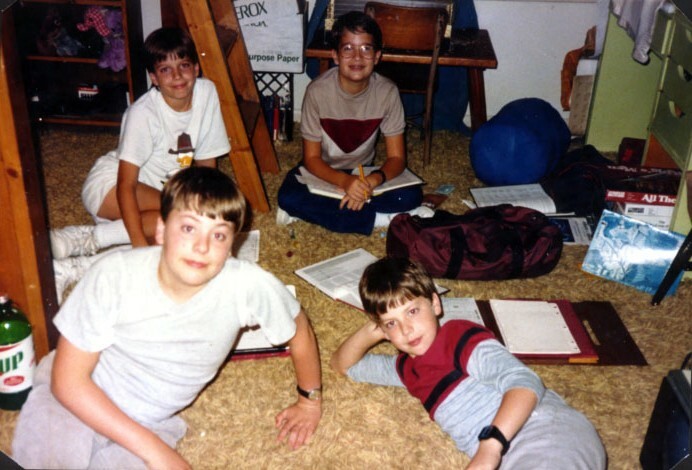 The kid on the left is drinking a Minute Maid Lemon-Lime Soda. I found a commercial for that too. Pay close attention to the giant can at the very end taking the water bucket challenge. Second shot: The blue book on the right is the rulebook for the first D&D Basic Set, a.k.a. “Holmes Basic,” released in 1977. Just above that, mostly obscured by the green dresser, is a board game called All the King’s Men. Originally released as Smess: The Ninny’s Chess in 1970, Parker Brothers re-released the game with a Medieval theme in 1979. I doubt that the revision was a coincidence. Cherry Coke tasted better in the cans with those graphics, today I prefer Pepsi Wild Cherry or RC Cherry even better is Faygo Cherry Cola if you can find it..
Cherry Coke and Mr. Pibb remain my fave sodas ever, although I rarely drink them these days. Hm. My brother & I were deep into D&D by the mid 80s, and for some reason my older sister got All the kings men for Christmas (I mean, she asked for it, I don’t really get why). I never saw her play it or anything and always hoped that when she was ready to throw it out, I could swoop in and nab the pieces … never did though. They’d have made great columns or statues for D&D. Tbe pieces are really well done! I never had the game, but there are some really nice close-ups at Board Game Geek.